Sun Valley has two ski mountains, Bald and Dollar. 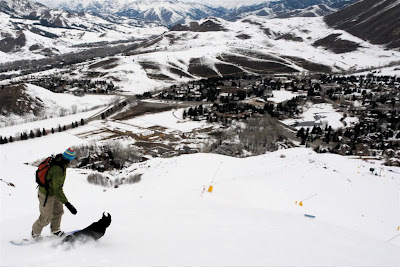 My hosts in Sun Valley, Brad and Naomi, happen to live at the bottom of Dollar Mountain, which is the beginner hill. While some people choose to take their dogs for a walk or run in the morning, Brad takes Leroy for a lap or two up Dollar before the lifts open. Despite a lack of planks, Leroy tries to mirror every turn on the way down. I fueled up with a bit of oatmeal and then headed out for a few backcountry laps under my belt along the Galena Summit south ridge. There were a few pockets of good snow, but the crust was creeping up the slopes. But my day was not done; I continued to Bald Mountain for a half day. Then I was done. Just a shade over 20 years ago, I made my debut on two skis at Sun Valley. At least that's what they tell me. My technique has improved and I have learned that it is best to free the heel (ski for real...), but unfortunately my steez clearly peaked many moons ago. I even had the Olympic spirit. I remember like it was yesterday. What great "piece of pizza" form you had back then and INTENSE concentration.